Stumbling about the Cheshire countryside soon after sparrow-fart – The Diesel-Electric Elephant Company. 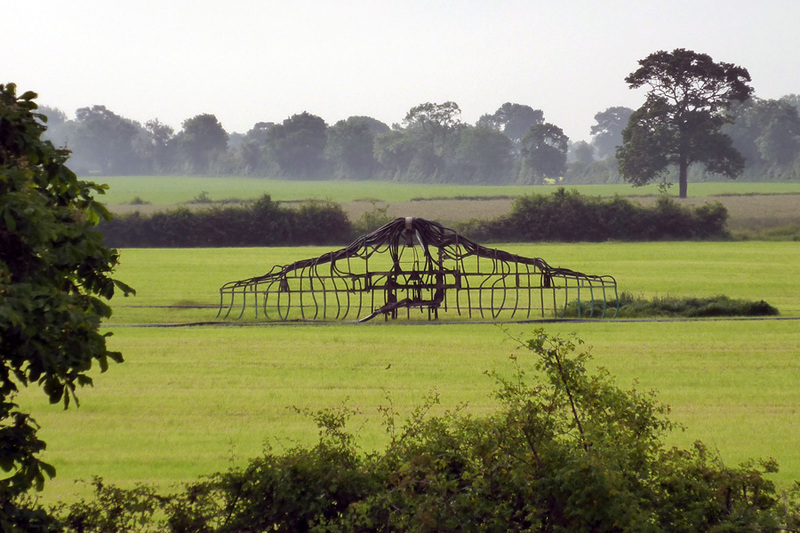 The skeleton of a Vulcan Bomber, picked clean by feral sheep and field-marmosets in a field in Cheshire. Body took brain on a walk yesterday morning. Brain didn’t want to go, but cabin-fever loomed and body prevailed, insisting upon at least a brief sashay and a short shuffle in the open air. If nothing else, said body, it keeps that musty smell a little at bay. Anyway, what did we spy on our perambulations together, but the eerie sight of the skeleton of a Vulcan bomber. It must be the annual Vulcan Bomber migration season again, and I suppose that this one just hadn’t eaten enough to see it through the long, long flight from Stoke Poges to Mablethorpe, or something, and fell out of formation. Once on land of course they are almost immediately seen to by feral sheep and field-marmosets, and the bones are picked clean. How sad to see something once so dominant brought so low. The bones will be there for years, I suspect – at least until the next Cold War. Anyway, the rest of the stroll was relatively uneventful. One of the wheels on my Zimmer began to display a mind of its own. My drip-dry jeans worked wonderfully and hardly left any trail behind me. I suppose it’s just possible that I have misunderstood the directions on the label, and they aren’t intended to be quite so liberating as I think they thunk I thought? Talking of thinking, I had been toying with the idea of buying Cheshire, but now that I know it’s on the Vulcan migration flight-path, I don’t think I shall. Have you seen the size of the droppings, for one thing? They put seaflaminherongullimots to shame in the poop department. Work on the Cardinal continues apace, and yesterday he gained a fully-functioning remote isolation switch for the starter battery, courtesy of the Chief Engineer. It makes a nice, satisfying “clunk” when the relay kicks in, means that I can isolate the starter battery from inside and, most importantly, saves some eleventy-three metres of hefty cable which has now been removed from the starter circuit. There’s now very little wire indeed in the engine bay, and such as there is has to stretch on tip-toes to connect what must be connected. It is now a lean, mean, engine machine – with a remote battery isolation switch. By the time we’ve finished, this boat will be far too posh for me to be seen in. Meanwhile, the search for the bodies continues in the marina car-park. If I had to hazard a guess myself, then I’d say that they are digging roughly twenty-seven and a half metres too far due north-east, and two point three metres too far out from the bank, but they won’t be sure of that until they’ve gone down at least one point five metres for the first body, two metres down for the second. One of these evenings they’re going to leave the keys in that machine, and then I’ll have some fun. And I’ll move the bodies again, just to be on the safe side. You have to understand I’m only a girlie which is a bit of a handicap when it comes to anything technological – the skeletor that you found looks remarkably like a plough attachment for reaping and harvesting that sort of thing. It could be why it failed to fly all the way, it’s just a thought. Just goes to show how we see what we see, if you see what I mean? Jolly good though!